1. Preheat oven at 180C. 2. In a large bowl, whisk together the flour & corn flour. Add in the butter, sugar and salt. Mix well. 3. Put the dough into a plastic bag. Use the rolling pin to roll out a rectangular size of 13cm x 26cm. Keep in the fridge to rest for 30 minutes. 3. Discard the plastic bag and cut the dough into 2 cm width long strips of 10 – 11 pieces. Then using the tines of a fork, make 2 roll small holes at the middle of each piece. 4. 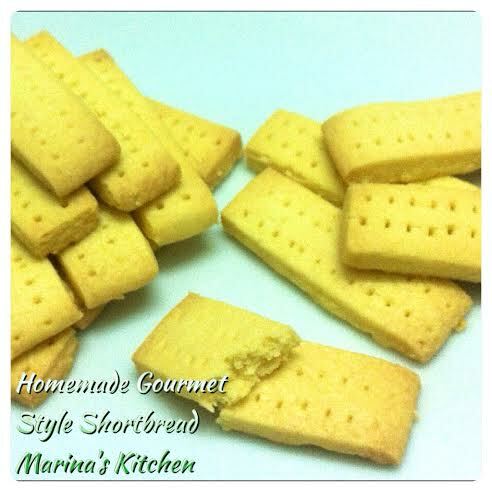 Transfer the shortbread to the baking sheet and bake for about 10-12 minutes. Transfer to a wire rack to cool.